High performance outdoor protection at a moderate price! Ultra'tect car covers were developed from the need for a car cover that would retain its color and strength in extended outdoor exposure, while providing a high degree of water resistance and UV protection at a moderate price. Ultra’tect covers accomplish all this and have an attractive custom fit. The Ultra'tect car covers are made of a solution-dyed fabric called WeatherMax® SL, made in the USA by Safety Components Fabric Technologies. This durable fabric is made to withstand the outdoors without fading or losing its shape. For people looking for an affordable, manageable outdoor car cover, the Ultra’tect is a perfect choice. Superior Shape Retention - Fabrics are resistant to sagging because the fibers are designed to have minimal stretch. Strong - Using double 150 denier yarns in both the machine and cross direction (2/150's MD & CD) helps provide higher strength and better water resistance than using single 300 denier yarns. Luxurious "Hand" - The weave gives Ultra'tect covers more durability and dimensional stability with a luxurious hand or "feel". Water Resistant - A highly water-repellent HydroMax finish on BOTH sides of the fabric helps protect against rain, while maintaining the fabric's breathability. Excellent UV Protection - Ideal for applications that are subject to prolonged sun exposure and extreme elements. Easy to Use - Ultra'tect's fabric weight is "just right" for everyday use...heavy enough to stay in place and light enough to easily handle on a day-to-day basis. The Ultra’tect car covers provide great outdoor protection and they’re easy to handle every day. If you park outdoors every day or on the street, the Ultra’tect will keep your vehicle clean and dry while providing excellent UV protection. The superior shape retention and fade resistance will keep your Ultra’tect cover looking good over the long run. This fabric is available in custom fit only. 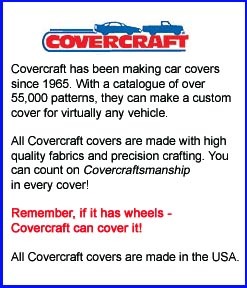 Antenna Openings - All Covercraft covers are made to fit vehicles with retractable antennas. If your vehicle does not have a retractable antenna, you will need to make a small opening in the fabric. Please indicate in the comment box of your order that you need an antenna grommet and we will be happy to send you one at no extra charge. Mirror pockets - If your vehicle was manufactured before 1965, the cover you receive may not have mirror pockets, even if it is a custom cover. If the pattern for your particular vehicle does not include built-in mirror pockets, we can send you mirror pockets for free, but they will not be sewn into the cover. Call us for details. This only applies to pre-1965 models. The Ultra’tect is available in gray, tan, black, and blue. Custom covers start at $275.00. Prices vary according to vehicle model. Car covers ship from the manufacturer via ground service. Expedited and international shipping are not available.